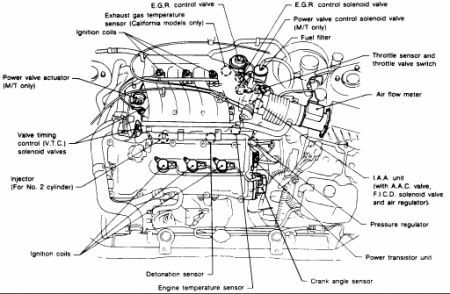 The fuel filter is inside the gas tank this guide will help you change it out and check out the diagrams below to show you on your car. How do I remove the hoses without damaging them? I've loosened the clamps, but hoses are stuck onto filter. It should be around 75.00. Based on where you live it could be different. my car acts like its running out of gas when it has gas. How do I change the fuel filter? The filter should be close to brake master cylinder. Make sure there is no pressure on system before taking any lines loose. Pull fuel pump fuse, start vehicle, let it run till it stalls, try more than once. Even then, be aware of fuel in the lines. can you tell me where the fuel filter is located? Located in the rear of the engine compartment, near the brake power booster unit. Where Is The Fuel Pressure Regulator Valve Located At And How Do I Go About Taking It Out And Replacing It. 2001 Nissan Maxima Not Sure??? When I Start The Car I Sometime Get A Strong Gas Smell For The First 3-5 Minutes, The It Goes Away.